During the third week of February, our COO Markos Romanos took off for a UK tour in a series of meet-ups (Swansea & Oxford), workshops and meetings with various stakeholders of the energy sector in the UK and Wales, in particular. There was a lot of interest generated and with the help of our advisor, Guto Owen, we made a series of very fruitful conversations and connections with the Welsh green energy eco-system. Overall, the presentation of the project was received with a lot of positive interest and it has already created a chain reaction in terms of the demand for more awareness around the synergy of blockchain with energy and of course, Pylon Network. Of equal importance, are the lessons that we took back from all these contacts and what we learnt about how the UK market operates, the energy transition present and future, how is the market regulated, who are the important players etc. Our particular focus was the operation of cooperatives, their structures/governance models, their access to the market and the identification of the main pains that they face. This article presents these lessons that we took home from our UK tour and go through the main focus points of our trip. So, without any more delays, let’s start our dive to the UK energy (electricity) sector. UK’s electricity mix is mostly dependent on natural gas, renewable and nuclear – with oill and coal covering less than 10% of the total electricity generated. Renewable sources (including biomass) accounted for almost 30% of the produced electricity last year. In terms of renewable energy, UK has more offshore wind power capacity than any other country in the world, and is helping set records in Europe too. Offshore windfarms have been making headlines as well as power, securing record low levels of state support in a government auction three months ago. Three major offshore farms will be built in the early 2020s for a subsidy price well below nuclear, and half what the technology cost just a few years ago. According to the Department for Business, Energy and Industrial Strategy, an ‘average UK household’ in 2017 consumed 3,800 kWh of electricity, which add to the running expenses of the house, an additional burden of £620 per year. According to Eurostat, the UK electricity, without taxes and levies, is a bit higher than the EU-27 average. If taxes are included, the British electricity price is ranked a bit lower than the EU-27 average. Between December 2016 and August 2017, all of the 6 major suppliers announced price rises for electricity consumers, which might not be reflected in the latest Eurostat’s data – (the increase was around 14 per cent, on average). A quite surprising socio-economic fact regarding the UK energy market is the spread of fuel poverty. Today, an estimated 4 million British households are fuel-poor and community-owned green energy projects are making attempts to address this problem (see following chapter on energy cooperatives). Pylon Network is built as an open, transparent cooperation tool between all energy market actors. It is structured to accommodate the existing market structures and is flexible enough to adopt to the specific needs/peculiarities of any energy market. Pylon Network is a smart energy data layer, which adopts on the existing structure of energy markets, while adding a full set of cooperation rules, which offer immutable transparency in all energy transactions. The operational structure of Pylon Network in regards to the typical energy market structure is shown in the Figure below. The Office of Gas and Electricity Markets: its primary duty is to protect the interests of consumers, where possible by promoting competition. The Authority‘s main objective is to protect existing and future consumers’ interests in relation to gas conveyed through pipes and electricity conveyed by distribution or transmission systems. Consumers’ interests are their interests taken as a whole, including their interests in the reduction of greenhouse gases and in the security of the supply of gas and electricity to them. In simple words, OFGEM is the organisation that defines all energy market players, sets the rules for each of them and overlook the operation of the market and the players’ interactions. The National Grid is the high-voltage electric power transmission network in Great Britain, connecting power stations and major substations and ensuring that electricity generated anywhere in England, Scotland and Wales can be used to satisfy demand elsewhere. National Grid Electricity Transmission plc is the owner and operator of the National Grid high voltage electricity transmission network. There are fourteen licensed geographically defined areas covered by six companies, where the distribution network operator distributes electricity from the transmission grid (National Grid) to homes and businesses. Under the Utilities Act 2000 they are prevented from supplying electricity; this is done by a separate electricity supply company (see below), chosen by the consumer, who makes use of the distribution network. From different talks we had during the trip it soon became evident that the TSO and DSO have a lack of communication and information sharing which creates frictions between the two of them mostly in terms of planning issues, complicated by the very strict regulations governing the energy market. This lack of communication and cooperation validates the same pain we have identified in the past for both the Spanish, as well as the Californian market. The necessity for an open database as a means to enable/empower smart girds, was also a central point of the conversation between our COO and the director of EDSO_eu Christian Buchel, during the panel discussion at the Grande Geneve conference last January. As a means of responding to that need, National Grid will set up a new, legally separate company to carry out the Electricity System Operator (ESO) function within the National Grid Group. The ESO will have a central role in planning and operating the electricity system, including balancing the electricity grid second by second. This will require the ESO to work more closely with local electricity distribution network operators (DNOs) to manage electricity flows across the distribution grids. There are six electricity suppliers operating in the UK that share among them more than 90% of the total electricity supply market, supplying more than 45 million customers. They are usually referred to as “The Big 6” and the club includes British Gas; EDF Energy; E.ON UK, npower, Scottish Power; and SSE; from which only the parent companies of British Gas and SSE are based in UK. Since 2014, independents (i.e. not The Big 6) have increased their share from 0.2% to more than 7.0% and currently, more than 3 million UK consumers have accounts with smaller, independent suppliers. This shift is attributed both to the increase of the sustainability awareness – consumers who shift to suppliers with 100% certified green energy – but also to an investigation by OFGEM regarding the operation of The Big 6 in a particular case of a national blackout, which sparked public awareness and reactions regarding the practices in the energy sector. At the moment, the National Smart Meter Rollout is underway, aiming at fitting around 53 million smart meters in over 30 million premises (households and businesses) across Wales, Scotland and England, by 2020. The programme runs through the utilities, who are obliged by OFGEM to offer a smart meter to all their customers until 2020. Part of this stirring force in the energy supplier’s market has been induced by the activities of energy cooperatives at a local community level. The role of the vast majority of energy cooperatives in the UK is limited to co-financing and co-ownership of renewable energy installations to benefit the community. The profits are being reinvested for the financing of new projects and in some cases different schemes for tackling fuel poverty are being introduced in the business models.There have been 5,000 community energy projects launched in the past five years alone, with plenty more on the horizon. Therefore, energy cooperatives in UK differentiate on an important factor compared to the Spanish (or French, German…) energy cooperative operational model. The difference is the ability to sell the electricity to the final consumer. In other words, cooperatives in the UK are not suppliers of electricity and are not the ones that bill the final consumer. There is only one cooperative player who has a license to supply electricity and has managed to gain a considerable market share (Coop Energy, part of The Midcounties Co-operative). UK offers both feed-in tariffs and export tariffs to prosumers (installations ≤ 10 kWp). The feed-in tariff for new installation is at 3.93 p/kWh (it is being revised every three months by OFGEM) and has been reduced considerably during the past years. The feed in tariffs are paid for 20 years and are exempt from income tax. On the other hand, the export tariff is at 5.03 p/kWh and is applied for up to 50% of excess power fed into the grid. 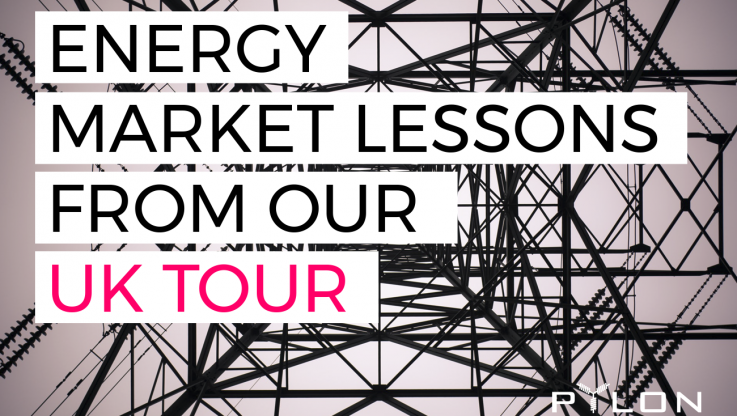 So, after spending one intensive week in the UK , what are the main outcomes after looking at the energy market with a closer look? Heavily regulated market, undergoing several structural changes, in an attempt to transform into a smart grid. Cooperative movement has started taking off during the last 3 years. There is a number of local co-financing and/or co-ownership cooperative schemes all around the UK which are financially feasible and a credible investment. A number of them integrate into it some very interesting social schemes, mostly targeted against energy poverty. However, it was surprising to see that the vast majority of the local cooperatives have not taken the step of accessing the supply of electricity sector – due to the high financial risk. Validated bottle-neck (again): the severe lack of information sharing and data integration between all the players of the energy market pyramid. There has been a regulatory response to that bottle-neck (National Grid’s ESO increased interaction with the 6 DNOs), which is aimed at increasing the cooperation between the two operational forces of the grid. As they say, the devil is in the details, so time will show if these changes will encourage cooperation and will allow it to flourish for the benefit of the grid and the consumers. The market is overall favourable for domestic, distributed generation compared to other EU countries (like Spain for example) allowing both the export to the grid and rewarding renewable production via a feed-in tariff, guaranteed for 20 years. In the UK, blockchain technology potential applications on the energy sector have raised the interest of various actors. There are currently a number of models that are being tested around UK, two of which are running under OFGEM’s innovation funding scheme. These so-called ‘regulatory sandboxes’ allows innovators to trial innovative business products, services and business models that cannot currently operate under the existing regulations. 1) A consortium led by EDF Energy R&D UK and including Electron, PassivSystems, Repowering London and University College London – trialling a peer-to-peer local energy trading platform. The platform aims to allow residents in urban areas to source their energy from local renewables and trade that energy with their neighbours, increasing self-consumption of low carbon energy and reducing overall energy costs. 2) Empowered – trialling a local peer-to-peer energy trading scheme. The trial is aimed at enabling consumers to trade electricity directly with each other and yield benefits for the local community and the wider electricity system. As explained in previous section, the energy cooperative business model in the UK does not include yet into the electricity supply business (with some very few exceptions): it focuses on co-investment and co-ownership of energy projects at community scale. This means that a big part of Pylon Network’s operation (the instantaneous and fee-less payment method for electricity) is not applicable for these cooperatives, since they are not the supplying electricity to final consumers (they do not bill their customers). Co-Financing with Pylon Token. The “obvious option” regarding the typical operation of UK energy cooperatives. PYLNT can be used for the co-financing and co-ownership management of renewable energy generation projects at communities. We validated that PYLNT can be a very useful tool for these organisations that tend to struggle in raising investment for their energy projects. Sanbox with OFGEM For such a scenario, there are two basic requirements: (i) that the proposed ‘sandbox’ is looking to test a new regulatory barrier – one that is not being examined by any other UK ‘sandbox’; (ii) that a complete consortium with the inclusion of an energy supplier will be needed (if the payment method with PylonCoin is to be tested). We are currently exploring the possibilities in regards to both of these requirements. Pilot without OFGEM This basically means any site/area with a number of consumers (and producers) that could be placed all together behind-the-meter; in other words micro-grids. The days spent in UK, presenting Pylon Network at Wales and Oxford and meeting so many people from different backgrounds, dedicated to change our current energy models, was a blast! Below, you can find some links different projects that we came across and we found them truly amazing! Have a look for yourself to get a positive message from today! We already know that many of these contacts will play their role in examining our UK options in the near future and we feel lucky for having the chance to discussing and engaging with them. We are very satisfied with the achievements and overall feedback that we bring home with us from this week and we hope you enjoyed the read. Looking forward to our future interactions with the great people that we met, working together for a paradigm shift in our energy models – cooperating for cooperation!